Appreciate the collections at Fremantle Prison and Western Australian Maritime Museum. Get some historical perspective at The Perth Mint and Fremantle History Walking Tour. Venture out of the city with trips to Mullaloo Beach (in Mullaloo), Sorrento Beach (in Sorrento) and Pinnaroo Valley Memorial Park (in Claremont). Dedicate the 9th (Thu) to wine at some of the top wineries in the area. Spend the 28th (Tue) exploring nature at Kalamunda National Park. The adventure continues: enjoy the sand and surf at Cottesloe Beach, tour the pleasant surroundings at Scarborough Beach, learn about wildlife with up-close encounters at Perth Zoo, and pause for some photo ops at Kings Park War Memorial. To find reviews, photos, and other tourist information, use the Perth trip itinerary maker website . Amritsar, India to Perth is an approximately 14.5-hour flight. The time zone changes from India Standard Time to Australian Western Standard Time, which is usually a 2 hour difference. In May, Perth is colder than Amritsar - with highs of 25°C and lows of 11°C. Finish up your sightseeing early on the 4th (Tue) so you can go by car to Armadale. Armadale is a suburb of Perth within the City of Armadale, located on the south-eastern edge of Perth's metropolitan area. 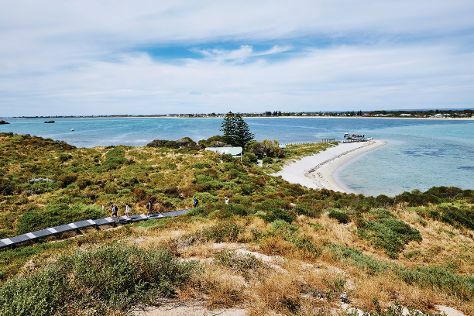 We've included these beaches for you: Warnbro Beach and Palm Beach. Your inner history buff will appreciate Old Blythewood and St Paul's Anglican Church. Explore the numerous day-trip ideas around Armadale: Barna Mia Nocturnal Wildlife Experience (in Dryandra), Rockingham (Lake Richmond, Rockingham Museum, & more) and Mandurah (Dolphin & Whale Watching, Dolphin Quay, & more). Make the 8th (Sat) an awe-inspiring day at Lane Pool Reserve. On the 13th (Thu), spend the day exploring the area around Logue Brook Dam. And it doesn't end there: identify plant and animal life at Dryandra Woodland, tour the pleasant surroundings at Kitty's Gorge Walk, head outdoors with Perth Wake Park, and explore the activities along Lake Preston. To find other places to visit, maps, and tourist information, read Armadale online road trip planner . You can drive from Perth to Armadale in an hour. In June, plan for daily highs up to 23°C, and evening lows to 9°C. Finish your sightseeing early on the 26th (Wed) so you can travel back home.